The 7’1”x 5’5” Rowlinson Britannia Arbour is ideal for enjoying wonderful garden views from the comfort of the sheltered and ergonomically shaped seating area. With room for two people, this practical piece of garden furniture provides a decorative feature for a garden setting. 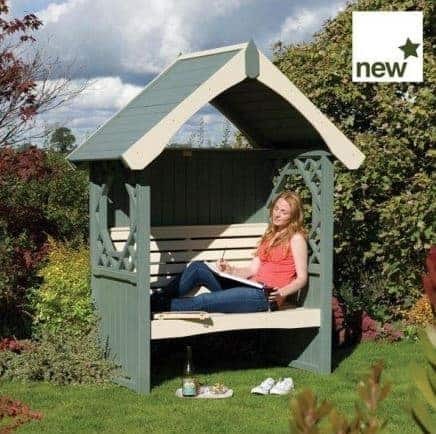 An arbour unit that is strong and extremely comfortable, this is sure to be a perfect addition to your garden. Of note is the back panel, which is created in tongue and groove style, and therefore sturdier than the one other arbour’s may have. The seat is shaped for comfort too, so you can enjoy a lazy afternoon in it.The arbour is created entirely from FSC softwood, so the sustainable aspect is there too. 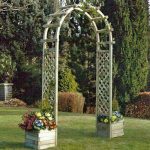 All in all, along with a solid 10-year manufacturer’s guarantee, this is an ideal garden arbour.The Britannia Arbour is supplied painted in Ronseal Willow & Elderflower shades giving it a stylish appearance that will also blend easily into the backdrop of the garden. The decorative side panels are part lattice design and feature a cut out viewing hole, allowing you to enjoy views from three sides of the arbour whilst sat on the comfortable seat. The Britannia Arbour is so much more than a garden bench, it provides a unique and stylish feature, from which you can enjoy the sights and sounds of the garden. In this section we discuss in further detail the features that the Britannia has to offer and how this fantastic product can fit into your garden lifestyle. Arch: The arch provides a shelter for the seating area, which is solid at the back and half-open at the sides. Protecting against the wind and sun, the arch is sheltering without being too closed in. The back and roof use tongue and groove panels, whilst the sides use half tongue and groove, combined with a lattice and octagonal peep-through panels. Seat: Measuring at 1200x480mm, the cream seating area is constructed from timber slats and is ergonomically designed with a high back and shaped seat for comfort. With plenty of room for two people, the arbour provides a comfortable seating area in which wonderful views of the garden and relaxation can be enjoyed. 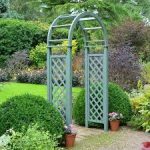 7’1” x 5’5” Rowlinson Britannia Arbour: How easy to build? The arbour is a small scale assembly project and therefore could be assembled by an individual with a basic knowledge of DIY. It is, however, the manufacturer’s recommendation that the piece be assembled by two people for both efficiency and safety reasons. 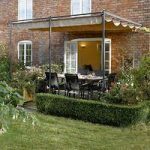 The arbour will arrive in a package containing all of the pieces and fittings required for easy assembly. Assembly is a very straight-forward process, using the simple and easy-to-follow set of instructions provided. We expect that the process could be completed within a matter of hours, leaving you to enjoy the arbour sooner than you may think. 7’1” x 5’5” Rowlinson Britannia Arbour: What is the overall quality like? 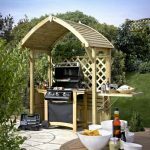 True to its name, the Britannia Arbour is British designed and manufactured, ensuring that the product is of the highest quality and design specification. 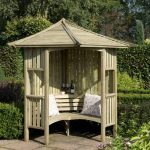 This particular model is supplied pre-painted in Ronseal Willow & Elderflower paint, giving the arbour a stylish finish that allows it to blend into its natural backdrop with ease. Manufactured from FSC softwood, the interlocking tongue and groove timber construction of the panels and roofing gives the arbour a sturdy feel and offers protection from natural weathering. A 10 year manufacturer’s warranty and 3 year colour protection warranty is provided to give you peace of mind that the product is of a high quality and will be standing strong in years to come. 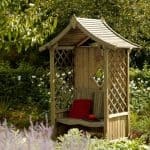 The 7’1”x 5’5” Rowlinson Britannia Arbour provides a stylish yet practical seating area from which to enjoy the sights and sounds of the garden. British designed and manufactured, this product is of a high quality and painted in on-trend colours to blend into the natural setting. If you are looking for a simple seating area then the higher price of the arbour may put you off, however, if you are looking for a stunning feature and seating area for your garden then this may be the product for you.